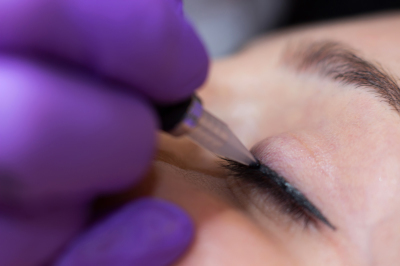 Permanent makeup is a form of tattooing that enhances one's natural appearance. The pigment will fade over time but may not completely disappear. Color boosts are recommended every 1-2 years to keep the color fresh. There are different methods of designing brows, eyeliner and lips. One form is using the rotary pen (electric) and another way is manually by hand. Kim prefers to use the hand tool method because of the control of the lines created and because it is less invasive for the client. With all procedures, disposable needles are used along with a topical anesthetic cream to relieve any discomfort. Pigment retention will depend on the age, type of skin, medications used, exposure to sun and skin products, and following aftercare instructions. All procedures require a follow up appointment 4-8 weeks after initial procedure. If you're are tired of filling in your brows or worrying about you liner smudging, the permanent makeup is the way to go. You'll save time in the morning getting ready for the day and not have to worry about it coming off and losing your color or shape. 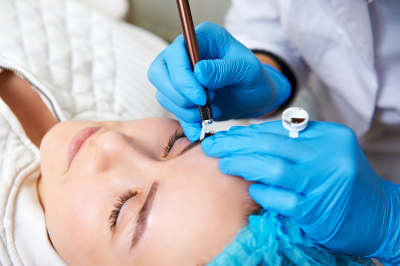 >> Are you a candidate for permanent makeup? Check out the Instructions & Care page to make sure this is the right procedure for you. Also known as eyebrow embroidery, fine like hairstrokes are drawn on the skin simulating the look of real like brow hairs. You can create a whole new brow or fill in an existing brow and no one will know the difference. Using the handtool technique, pigment is tapped into the skin creating eyeliner. Different size needles are used to achieve the thickness of the line. Ombre is the shading of pigment that transitions from light to dark creating a dimensional look to the brows. Powder is the soft shading throughout entire brow for those who want a filled in solid look to brows without looking too harsh. Microblading is a highly skilled technique and requires experience, time, and hard work. Kim is formally trained and certified in permanent makeup - a rigorous course of study beyond the basic microblading certification.